with these science-based one-minute practices (free). They tend to shrink by about 5% per decade after 35 years of age. But you can do something about that, whatever your age. Your genes can't be altered (yet), but the rest is up to you. You can learn to shield your brain from avoidable and unnecessary harm. These one-minute practices will start you on the road to more peace within now and brain power for years. A woman's brain has about 19 billion neurons and about 100,000 miles of internal wiring (axons). If you laid those axons end to end, they could go around the earth 4 times over. That awe-inspiring treasure is worth protecting. These 10 one-minute practices can help you thrive amid life's challenges without hitting the wall and burning your brain out. The best part? Each practice takes less than a minute! Fuzzy thinking, belly fat, worry, exhaustion, trouble sleeping, irritability, feeling stuck, being too hard on yourself: all these are common and not good for your brain. But you can do something about it. Get the guide and learn how. Alzheimer's is increasing. There's no cure yet. Care for your brain now with these simple but powerful one-minute practices, whatever your age. Dementia care costs up to $100,000 per year (private room in a nursing home). Brain planning is even more important than financial planning. You care for your loved ones, your home, your car and your finances. How about caring for your brain? Learn how, with these 10 one-minute practices. Get the guide now (free). The third one-minute practice is my absolute favorite. Not only has it transformed my busy life, but everyone who learns it simply loves it. How long does it take to work? Less than a minute! And it’s powerful. Get it now, in the guide. Just click the button. There's so much information on the internet. Tired of hocus-pocus or guesswork and hungry for reliable science-based solutions? Then you need this science-based guide. Will these practices solve all life’s problems? Of course not. They form a useful, practical first step. Every journey starts with the first step. This guide will give you that all-important first step. Get it now (free introductory offer). Picture yourself feeling uplifted, with boosted confidence. I love living this way, enjoying peace within despite all the pressures and challenges of life. I’m fitter and more joyful now than I was 30 years ago. Anyone can learn how to do this, because it uses a set of science-based processes. You, too, could experience the power of science. It's just a click away. Get your guide now (free). Get it before the free offer ends. Science works powerfully. Let’s make it work for YOU. I'll be on the inside, ready to help you with any questions. Joel Almeida, PhD, MBBS, MBA. P.S. 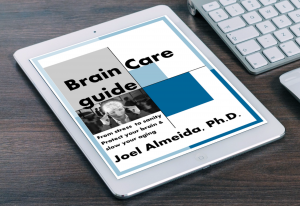 Get your Brain Care guide (free offer) with science-based one-minute practices. Perfect for a busy, stressful life. Protect your brain, slow your aging. Get your guide now.